Ask anyone to name the most polluted city in the world and chances are the immediate response will be Beijing. 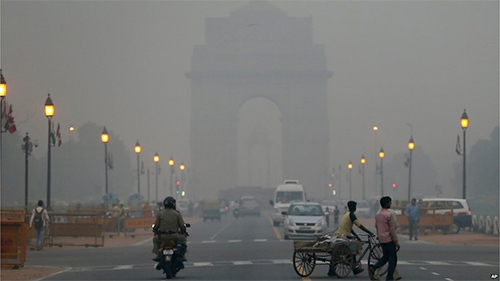 In truth, the Chinese capital is only half as polluted as the city in the top spot — Delhi. In fact, 13 of the top-20 most polluted cities in the world, according a World Health Organization (WHO) report from last year, are in India. This has led to fears for the health of children living in Asia’s third-largest economy. In Pakistan, where the death toll has now surpassed 1,000, protesters directed their anger at the government for failing to adequately prepare for and respond to the heat wave, including by operating electricity grids that have long been prone to daily failures, thereby shutting off cooling fans and air conditioners. In addition, many people in the port city of Karachi, which is the most populous city in the country and was the epicenter of the heat wave, lack running water or had water cut off whenever the power went out. Similarly in India, where 1,700 people have died from a heat wave last month, people have publicly protested against the government for the lack of a reliable power supply. Some protests turned violent, as was the case earlier in June in Uttar Pradesh, in northern India, where protesters set fire to a power station and held power company officials hostage for several hours. Yet, in India at least, more reliable electricity may not have significantly reduced the death toll. “[The people who died] are migrants, they are people who do not have coping capacities, people who can’t afford air conditioners, these are the ones who suffer the most,” said Rajita Kurup, Oxfam India’s food and climate change program coordinator, in an interview with Mashable. The high number of deaths signaled a lack of preparedness, according to Anjali Jaiswal, the director of the India program at the Natural Resources Defense Council, an environmental group. Many heat-related deaths are preventable and there are easy prevention methods, Jaiswal says. “It has been a huge wake up call” for both countries, she said. It may seem especially challenging for governments of developing countries to address problems brought about by climate change as they lack the economic resources that developed countries have. For example, when a heat wave killed hundreds in Chicago in 1995, the city responded by developing a heat wave emergency response plan, launching a green roofs initiative to reduce the urban heat island effect that keeps cities warmer than surrounding areas, and many other actions that required significant investments. One local government in India has already taken steps to be prepared for extended heat waves. Leaders in Ahmedabad, the largest city in the north Indian state of Gujarat, worked with Knowlton and Jaiswal to develop and implement a heat action plan two years ago. This followed a 2010 heat wave that led to 1,344 excess deaths in the city alone. The plan consists of four pillars: educating the public about heat-related illnesses and preventative measures, initiating an early-warning system for the public, local governments and local medical officers. In addition, the city has been training medical staff and promoting adaptive measures for groups to implement. “You don’t necessarily need a complicated solution,” Jaiswal said. She pointed to Sherdaben General Hospital in Ahmedabad, a hospital which serves a slum community, as an example where a low-tech, low-cost solution saved many lives. The hospital had a black tar roof, which increased the building’s temperatures. Further, the neonatal ward was on the highest floor, meaning that many mothers and their newborns were put at greater risk of heat-related illnesses. The solution? The hospital installed a white roof, which lowered the internal temperature of the building significantly, and the staff also moved the neonatal ward to a lower floor. Though poorer cities may be lacking in economic power, “[they] can also have great success in having strong leadership and strong local communities, social networks and groups that are great at reaching people quickly,” Knowlton says. We’ll be hearing a lot about “energy poverty” in coming months, following up on the Pope’s recent climate initiative, and prior to the Pontiff’s visit to the US and address to Congress in September. The bogus talking point is that the developing world needs more coal power plants asap to elevate living standards. As the items above indicate, merely mimicking western models is not likely to solve India’s grid problem anytime soon, especially in currently underserved rural areas. Following a huge blackout in 2012, which plunged almost 700 million Indians into darkness, major initiatives were announced to rebuild the ramshackle, inefficient electric transmission system. There is hope that with a modernized grid, opportunities for renewable energy development will be maximized, and Asia’s chances to “leapfrog” the west’s centralized grid, and move to a fully renewable economy, will emerge. China used to have all but 1 of the top 10 spots for most polluted. The sad truth is that all that polluted air is likely having an overall cooling effect so cleaning it up will make breathing easier but may not bring any relief from the rising heat. It changed when the South Asian countries made enough progress to follow China’s development path. I have been chanting CHINA-COAL-INDIA for a while now, and India is fast overtaking Shina in population and contributions to pollution and GHG emissions. The 1.7 billion people in South Asia have little hope of avoiding the massive pollution that China is now fighting with some success—IMO, it’s going to get worse there before it gets better. 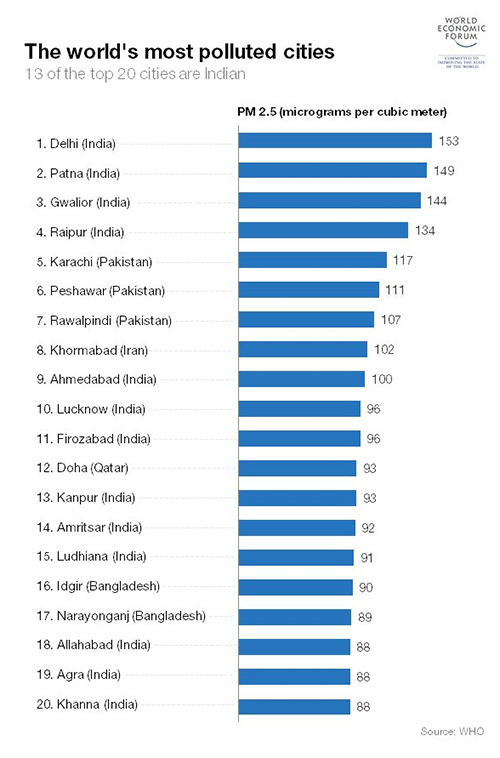 Note that 18 of the 20 on the most polluted list are South Asian, Iran is close, and Qatar isn’t really a country. Note too that the rankings are based on PM 2.5 particulates, the smallest and most unhealthy—-the PM 10 rankings may be slightly different. A couple days ago I read that India is refusing to set an emissions target so I guess the troglodytes on the right will start using that country as the next reason to delay cleaning up America’s act now that China appears to be reversing course on emissions & pollution. The troglodytes have already been at it, shedding crocodile tears about all the poor people in the world that have little or no access to electricity, and asking “who are we to deny them the use of the cheap coal they have access to”?. Don’t we heartless global warming alarmists care about them, they ask? If you can find some fool to take the bet, you can bet that any failure on the part of ANY country to do the right thing at the Paris talks will be used as an excuse to delay, but India IS likely to be the next big straw man. India is a special situation because of the many problems it faces, as Keith Schneider so eloquently pointed out here. Right now India’s per capita CO2 emissions are about 1/4 China’s and 1/10 of the U.S.’s, and it is on track to emit more in total than the EU in the next few years. It will be very hard for India to “develop” and improve the lot of its citizens while at the same time lowering emissions. It’s worse than that – reflective sulfate aerosols and the clouds they seed – stay in the atmosphere for just days or weeks, so air clean up will result in a rapid pulse in rising temperatures. Cooling pollution, according to Hansen’s work 10 years ago, is the second most powerful driver of climate that he studied (not including H2O (rising) and the primary insolation (pretty constant). It’s the most powerful coolant and getting rid of it (if possible) will be a big deal which isn’t talked about near as much as it should. I don’t think there’s much chance of a sufficiently rapid decrease in aerosols to cause a pulse in temperature. And lower pollution may (one hopes) coincide with less fossil fuel burning, which in turn will help reduce warming. Granted it’s a slower though longer lasting effect.